Onwards from Basey town in Samar, Tutubi proceeded to the next town of Marabut to catch sight of the rock formations and secluded white beach nearest to Tacloban City. There are no beach resorts seen by Tutubi when he went there, probably located on the other side of the cove. He only spent a few minutes to take pictures with an umbrella over his head since it's still raining. 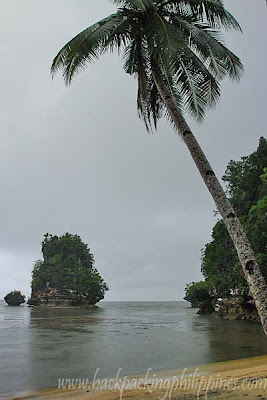 Other rock formations in Samar are in Biri town. Commute: buses and jeepneys to Marabut are available from Tacloban City Bus Terminal. Driving directions: you can reach the town and the beach via around 33 km travel under an hour from Tacloban passing San Juanico Bridge and the Samar towns of Sta. Rita and Basey. Directional signs will guide you along the way. seems like you've already toured the Philippine archipelago. :) nice..
dont mention the word kayaking. it calls me to go out and do it. LOL. it's one of my favorite watersport. i like the calmness of the water in that cove. Beautiful view & shots! Been to tacloban many times but never been to this part of tacloban.Really gorgeous! 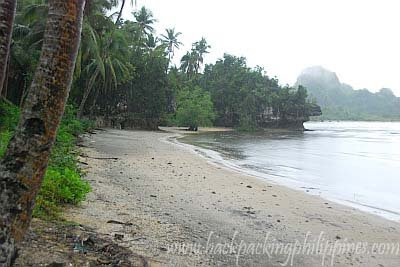 The Philippines is simply full of beautiful beaches and places to recharge the batteries. Very nice reporting and the pics are excellent, as usual. This is one place I should go when I visit home. how are you? :P happy holidays! Wow, that place looks pretty neat. Shame about the burnt in sky in the second photo, but I guess it couldn't be helped.